ProSteel includes design routines for three types of 'simple' connection: bolted angle web cleats, flexible end plates and fin plates. All three of these can be used for beam/beam or beam/column connections. 'Simple' connections are assumed not to transmit any moment from the beam to the supporting beam or column, and for this to happen (though of course in practice it probably does to a limited extent) the connection must allow a limited amount of rotation. With angle web cleats this comes from slip in the connected parts and deformation of the cleats. End plates and fin plates are deliberately constructed of relatively thin material that will deform rather than transmitting any significant moment. 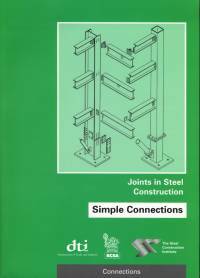 ProSteel's connection routines are based on the guidance contained in the SCI/BCSA publication P212: 'Joints in Simple Construction: Simple Connections', 2002 edition. If you are going to use ProSteel to design or check connections you should obtain a copy, as these notes can only give a summary of the information that it contains. To form beam to beam connections it is necessary to notch the top (and sometimes the bottom) of the supported beam to clear the flange(s) of the supporting beam. The BCSA designs use a 50mm deep notch, rather than the minimum notch depth specified in the steel section property tables. When detailing connections you need to check the program output to ensure that the suggested design can be physically constructed, e.g. that there is adequate room for tightening bolts. All connections are only as strong as the weakest link - the information provided will enable you to identify what this is. The main advantages of angle cleat connections are that no welding is required, and that the 2mm bolt hole clearances allow minor adjustments to be made on site. Disadvantages are that the standard 90 x 90 cleat size does not allow connections to be made to the webs of 152 or 203 UCs; two sided connections are difficult to erect and can cause problems where the beam sizes differ; and skewed joints cannot be accommodated. Where special surface treatments are required the cleats will need to be treated before assembly. 2 x 40mm [end distance] + (n-1) x 70mm [bolt pitch]. ProSteel only checks angle cleat connections with one line of bolts through each angle leg. The main advantages of end plate connections are that full depth plates can provide 100% shear capacity, connections to column webs present no special problems, and surface treatment of members is straightforward. Disadvantages are the limited tying capacity and the difficulty of erecting two sided connections. BCSA flexible end plates are defined as 'Light', cut from 150x8mm flat, coded EA2-5, for beams up to 457mm nominal depth, and 'Heavy' cut from 200x10mm plate coded EB6-11 for larger sections, with bolts at 90mm or 140mm cross centres respectively. Connections to the webs of 152 or 203 UCs will require narrower plates. The plate length is the sum of 2 x 40mm [end distance] + (n-1) x 70mm [bolt pitch]. 6mm welds are generally used: these should not extend along the top and bottom of the plate if possible. The plate length should be at least 0.6D (D=beam depth); for smaller UB and UC sections used as beams it will probably be necessary to use a full depth plate welded to the beam web and insides of the flanges. A thin plate (8mm or 10mm) should be used to avoid overloading the connection. The BCSA guide states that moderate distortion of the plate during welding is not a problem as the plate will be pulled flat when the connection is assembled. Fin plates are a relatively new development but are becoming increasingly popular. A vertical plate is welded to the column flange or web and bolted to the beam web. In most cases the plate is set to one side of the column centre so as to keep the beam and column centres in line with one another. Fin plate connections can easily accommodate off centre and skewed beams, and present no erection problems, but may be more liable to damage in transit. Long fin plates may require stiffening and beam flanges may be need to be reduced in width ('stripped') to allow connections to be made to column webs. The BCSA guide now includes additional dimensional checks where using fin plates to support beams deeper than 610mm: such cases are not currently checked by ProSteel. BCSA fin plates are cut from 100 x 10mm flat with one row of bolts or 150 x 10mm flat with two rows of bolts. The codes are Fan and FBn respectively where n is the number of bolts or pairs of bolts. The plate length is 2 x 40mm [end distance] + (n-1) x 70mm [bolt pitch], and should be at least 0.6D. ProSteel only considers fin plates with a single line of bolts. The weld size should be at least 0.8 x the plate thickness: this ensures that the welds are stronger than the plate, and thus no calculations are required. The clearance between the top flange of the main beam and the notched end of the secondary beam is assumed to be t/2 + 2 mm to the nearest mm. The actual length of the notch cut out of the secondary beam will be reduced by the thickness of the end plate or the clearance between the supported beam end and supporting beam for other connection types. The minimum and maximum spacing of bolts should be in accordance with BS5950 clauses 6.2.1 and 2, i.e. 2.5D and 14t, where t is the thickness of the thinner ply. The bending stress on the reduced secondary beam section at the notch is unlikely to be critical but is checked if the connection is being made with angle cleats or end plate connections. For beams notched at the top only, the properties of the reduced section are calculated ignoring the fillets to the bottom flange. The check is not required for fin plate connections as the bending strength of the fin plate will be less than that of the beam web. Structural integrity checks are not carried out by the program, and if you are relying on connections to provide ties within the structure, as required by section 2.4.5.2 of BS5950, you will need to do further checking. The BCSA Guide (Volume 1, page 5) suggests that it is better to meet the tying force requirements using other structural elements, for example by using floor reinforcement and shear connectors. Our ProSteel and EuroBeam programs include connection design and checking. Not a user?